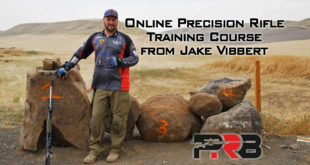 Home / Rifles / Cartridges / How Much Does Muzzle Velocity Matter? I have a friend named Bob, who’s a velocity addict. He is always running the latest hot-rod cartridge. To prove my point, his most recent rifle builds were a 300 Norma Magnum (launches a 230gr bullet up to 3000 fps) and a 6.5x280AI wildcat (launches a 140gr bullet at 3260 fps). I mean it wasn’t good enough to neck the 280 down to a 6.5 … he also Ackley Improved the case to get that last bit of velocity. It’s a wildcat of a wildcat! Do you have that friend? Are you that friend?! If we’re 100% honest, there is a little velocity fiend in each of us … me included. 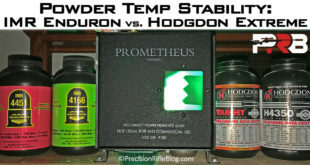 Now it’s one thing to pick a hot-rod cartridge, but most of us who handload are tempted to push our cartridges to the limit … and a few may even go a little beyond recommended max loads (which I don’t condone). Whatever cartridge we’re using, we’re tempted to squeeze out just a few more feet per second to really get the most out of it. Another way guys come at this is by running 26” or 28” barrels or even longer. 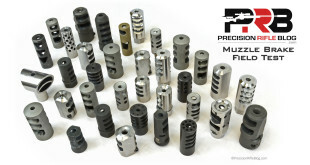 Our example cartridge for most of these posts has been the popular 6.5 Creemdoor, and Berger Bullets Reloading manual says for that cartridge “Muzzle velocity will increase (or decrease) by approximately 25 fps per inch from a standard 24” barrel.” QuickLoad confirmed those estimates. So a lot of guys run those longer barrels, but a few shooter go with shorter 22” barrels … even though they know they are giving up some muzzle velocity to get there. So what’s the benefit of pushing handloads to pick up those last few feet per second of muzzle velocity? Or, what are you giving up if you want to go with a shorter barrel? I ran several simulations all with the same inputs for ballistics and uncertainties, but simply changing the muzzle velocities. This is all based on Applied Ballistics ballistics engine, so it should be very, very accurate. The muzzle velocities represent the low end of where I’ve seen 6.5 Creedmoor rifles with short 22” barrels firing the Hornady Factory 140gr A-Max Match Ammo through the upper end of what I’ve heard rumors of guys getting with the cartridge. I am NOT saying that you can or should try to run the 6.5 Creedmoor at the muzzle velocities displayed, but I’m simply trying to illustrate what the real benefit would be if you were to chase muzzle velocity to that point. Notice the returns in this case appear mostly linear, although there are slightly decreasing returns with each step up in velocity. On average, you are increasing your hit percentage by 0.75% with each 25 fps increase in muzzle velocity. It’s not even a whole percentage point! Come on, that is so low it even surprised me. Honestly, if you’re having to push the max load of a cartridge to reach some target muzzle velocity … you’ve picked the wrong cartridge. 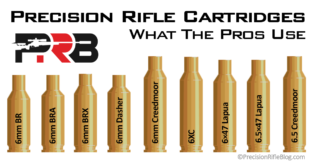 As the last post clearly showed, there absolutely is a measurable benefit to picking a cartridge that is capable of higher much higher muzzle velocities. We live with an unprecedented abundance of cartridge choices. 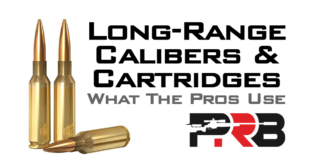 There are so many cartridges out there, that it is easy to find one to launch the exact bullet you want at the exact muzzle velocity you’re wanting … without pushing the limits of safe pressures. The 0.75% benefit of trying to eek out that last 25 fps out of a cartridge that isn’t intended to go that fast is just not worth the cost that could come with that. Start by picking the right cartridge that will give you the velocities you’re looking for below the max load, and then tune your load within that safe range of pressures. Previous How Much Does Cartridge Matter? Next How Much Does Accurate Ranging Matter? Please include also “How Much Does Range Estimation Matter?” and compare same catridges as in “How Much Does Cartridge Matter?”. I belive range estimation error is bigest reason to use extrem speeds. I generally agree with this article. However, a good point is missing and that is of MBPR at your closer ranges 50 to 400 yards which will increase dead hold much further based on velocity which, I believe will reduce first fire misses due to not requiring exact ranges. Although this may not be a focus for target shooters it most definitely is something to consider for our hunting friends who don’t always have time to know if that deer or coyote is 169.7yds or 316. 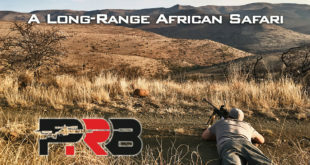 I am a big fan of having a zero for a +/-3″ MBPR as far as possible and have DOPE set for longer ranges which, usually, give you time to get an accurate range and time to dial. 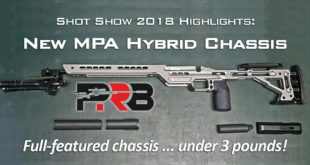 While there is risk that your accuracy will reduce at or near max load, you have already shown us that a 0.5MOA rifle at long range doesn’t gain us much more than a 1MOA rifle. I must say these articles are extremely informative and I enjoy reading them. Keep up it up. Great points, Brian. You’re absolutely right. Just depends on the situation you want to optimize around. A deer and coyote hunter myself, I definitely understand what you’re saying. I took a monster mule deer one year (biggest I’ve ever shot), and thought it was 150-175 yards … It turned out to be closer to 275. I definitely had buck fever, and it all happened so quickly! Luckily I was using a flat-shooting cartridge and it didn’t matter whatsoever … still a great placed shot for a quick kill. But small increases in muzzle velocity just don’t have a huge impact. 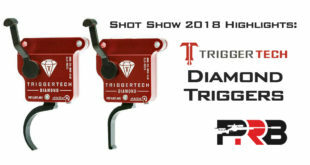 Picking a flatter shooting cartridge that runs 100+ fps faster than the one your trying to push to the limit … now that can help, but I just don’t think we should be so compelled to push a cartridge to the max (or slightly beyond into the red). We all know guys that do that, and we might even be that guy from time to time. It’s a better plan to pick the right cartridge for the job and stay within the established range. Speed is not that great of a factor when you consider it against group size, if you aint grouping tight then higher speeds just mean your bullet flys by the target faster and nothing else.Every rifle I have can be loaded to shoot perfect velocities to minimize group size, Find the load in the higher node that groups well and that’s what your barrel is good for, each barrel is different, you compensate by adjusting elevation not powder charge. But, you can find that accuracy node within safe pressures. There is no rule of physics that says that only appears at higher velocities. Higher velocity is just relative anyway, meaning higher velocities for that cartridge. And group size isn’t as important as you think at long range. Raw precision is important for short range targets, but quickly becomes less important as your target moves out further. I read that article. Am not sure I agree with the conclusions fully though. Great, Jerry. I actually love people who don’t just believe everything they read on the Internet. I can attest that the analysis was ran correctly, but my goal is just to present the data and allow you as the reader to draw conclusions. Sounds like you’ve done that. For Me, the extra cost of wear of brass, dies, forming, barrel life, is not worth it for .75%. Then as you state, can you find the accuracy node at that high end and be in a safe pressure area, for me usually not! Nice write ups Cal have learned a lot. Yes, sir! Same here. It can easily cut brass life in 1/2 and barrel life by 30% or more. If you calculate what that costs, it’s very significant … and the benefit is 0.75% increase on hit percentage?! That sounds crazy when you think about it. This actually surprised me how insignificant it was, honestly. We’re all learning here! Great article. Thanks, Just wish I lived closer to a 300+ yard range to test some of your stuff. Cal so far you have been evaluating the effects for fairly “large” targets as compared to the expectations of a F-Class shooter. It would be interesting to likewise look at 0.5 and 1.0 MOA targets too. 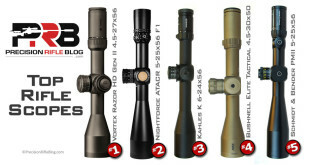 I plan on speaking to F-class targets in the final post, but for the most part … I’m focusing on targets that are more applicable to the long-range hunter, tactical competitor, or military sniper. All of those disciplines have to make first shot hits on a target. 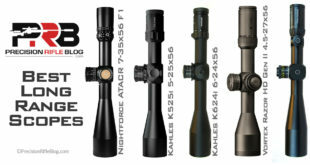 They don’t have the luxury of getting sighters, walking the bullet onto the target, wind flags, or shooting in the same wind on square, flat ranges. So the target sizes are appropriate for that style of shooting. F-class is just a different game. I’m not saying it isn’t challenging … it’s just different from what I’m focused on. I will touch on it lightly in the last post, but if you really want to see these simulations for your specific scenario … I’d suggest you buy the software. I do this all for free in my spare time, and don’t have time to run specialized scenarios for everyone. The US is obsessed with velocity as the universal ticket for shooting success. 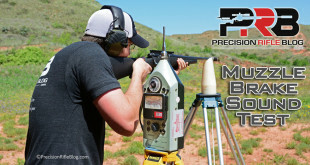 The work we did in the late 90s and early ’00s in F-class and 1000 yard BR demonstrated that there is an “ideal” velocity node to work towards – 2950 to 3150fps, depending on calibre. 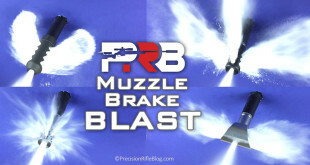 This will keep you supersonic beyond 1000 yards while providing competitively small groups. But you have to do the work up yourself and spend the time behind the trigger. Fancy graphs and ballistics software doesn’t compensate for the preparation time. BTW, making an Ackley case does add volume for velocity, but the real benefit is preventing the brass from growing during the reloading process. Have a look at the difference between a 6.5 x 55 Swede and the 6.5 Swede Ackley for brass growth. Couldn’t agree more, Richard. Many good points. You seem like a sharp guy. What’s your background? Competitive rifle shooter and writer. Sweet. I appreciate your input! I think the STW / RUM / SAMU / RUM / Weatherby / Lazzreroni mindset overbores were hunters attempt to shoot a rope to 400 or 500 yards [ i.e. PBR ( Point Blank Range) before laser rangefinders ]. 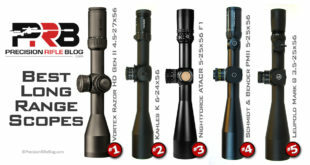 These were designed for hunting rifles where barrel life would last the owners life. Richard’s 6.5×55 remarks parallel those of former Precision Shooting & Varmint Hunter mag writer Bob Jourdan and his BJAI Swede. Thanks Cal for a forum for Litz Like Analysis of PRS and sharing it with us LRH. This medium is the Rogers Dry Lake that all these far flung hypothesis either fly high or crash and burn upon. Hello. I use the same software but my numbers and yours don’t seem to agree. Is there a way you could post the values of the other fields you’re using, especially for the “how much does velocity matter” piece. Thank you! The fields are all in meters, but I know more of my readers speak in yards … so I’m doing some translation there. The range uncertainty in these examples it the equivalent of +/- 1 yard 95% of the time (meaning an SD of 0.5 yards). And like I said in the graphic with the chart, the precision is 0.25 MOA, the muzzle velocity SD is 10fps, and the wind confidence is within 2.5mph 95% of the time (meaning the SD is 1/2 that). Hope that makes sense! 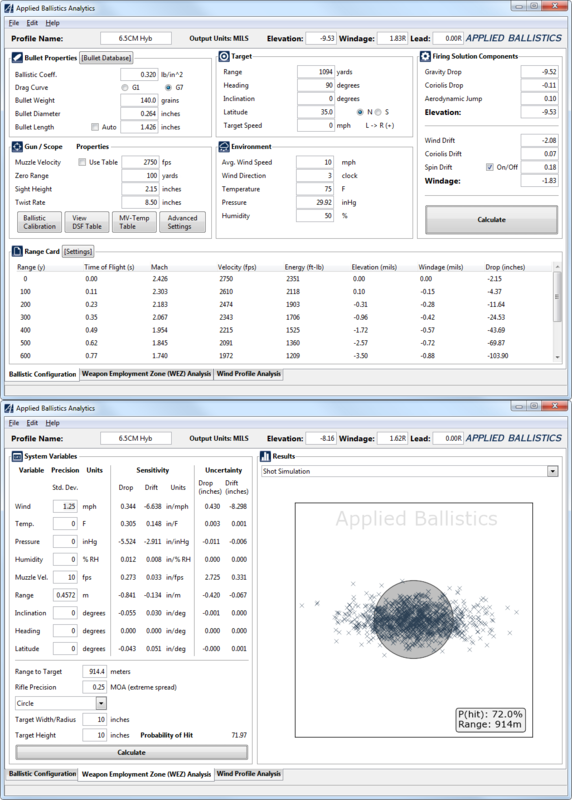 If it makes you feel any better, the Applied Ballistics guys who wrote the software have commented that I’m using the software exactly as it was designed to be used and they’re also keeping up with this series of posts. But hopefully this will give you all the details you need to duplicate the results. Thank you very much Cal. Yes, the .4572 range variable. Also, your email references a 20″ target but the screen shots are for 10″. Thanks again. Yeah, I ran both. I just emailed you the other one. You’d just change the range to 640 meters (equivalent of 700 yards) and the target size to 5″ radius. I have recently done a little research into this subject myself, although I don’t have the benefit if the exotic Litz software. I arrived at pretty much the same conclusions as yours. After coming to the conclusion that I am nearing the end of the effective life of my AIAX barrel, I am going to be backing off to a lower node that was identified on my ladder testing. 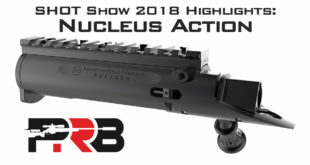 I will probably go to a full 26″ length barrel on the replacement so that I can maximize the available velocity from a lower pressure load that will optimize barrel life. I’m with you, Jay. I just had case separations on the 6th firing on my 6XC. Dang, I put a lot of time into brass sorting and prep for it just to last 6 firings! Especially at $1.15 per case. I’m thinking about backing off a little, even though I’m under the published max load to try to get more brass life. I’m at 1200 rounds, so we’ll see what barrel life is going to be like soon. How often are you annealing ? I had this conversation with a friend just a couple days ago! I don’t anneal (currently). But my problem wasn’t with the necks cracking. The separation happened near the case head, and I’m not sure annealing would help with that … would it? I have a buddy that runs a 6XC, and he told me this week he anneals every 3 reloads. But after 6 loads a few of his primer pockets were loose. I’m sure he runs the Norma brass just like I am, and honestly I’m a huge fan of Norma brass. I’ve weighed a lot of brass of different brands (including Lapua, Winchester, and many others) and I’ve found Norma to be the most consistent. 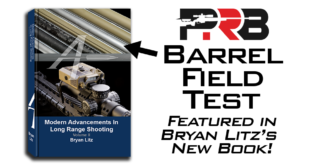 I use Norma brass on my 7mm Rem Mag running loads that about 90% of the max load, and I’ve gotten 10 reloads out of that brass … and it seemed like it could go for more. I rebarreled that rifle after the 10th loading, so I thought that was a good opportunity to start fresh with brass. I actually do that all the time. I try to buy enough brass to last me one barrel, and then start with fresh brass on each barrel. I think my problem was that I had the die adjusted too far down, and was setting the shoulder back a little farther than I had to for my chamber. So it was causing the cases to need to be trimmed just about every time I reloaded. I finally noticed the pattern on the last couple reloads, and noticed the cases seemed to be growing by about .008″ each time. That is more than I’ve experienced with other cartridges. So I’ve adjusted the die some so that it is just barely pushing the shoulder back. It’s a custom Tubb die, which allows you to adjust a few things that you can’t with most dies. They really are amazing dies, but I may have just goofed on the original setup. They didn’t come with great instructions. We’ll see how this next batch of brass does. The batch of 6XC brass I was using might have just been abnormally soft … who knows. Rick, actually on this scenario I specified precision of 0.25 MOA. It’s a centered group, but the distribution of the shots is spread out within that 0.25 MOA group. You can see I specified that (and a few other important factors) on the graphic. I enjoy your blog quite a bit, and especially appreciate the non-combative manner you use in your replies to the folks who post. But now, I try to keep things a bit more sane. If I feel the need for more speed than 2600 to 2650 in my 308’s, I just step up to another cartridge. While I do understand the max point blank range point of view, I think it was more relevant in the days before affordable laser rangefinders. Anywhere we hunt, we scope out the area, and note range markers. That lets us know the range to pretty much anything that comes into that area. Dialing the scope for a precisely placed shot helps avoid wounding animals, and either having to track them or losing them altogether. A shot that might in theory fall just to the bottom of the kill-zone sized area on a deer could in fact drop farther than that. If group center moves low, the low shots in that group will fall below the kill zone. 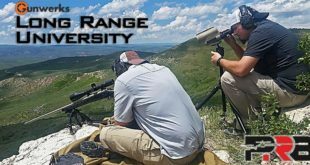 So dialing for the exact range is the most effective and most ethical course of action in my opinion. Hey, Dan. I’m a big fan of your work! 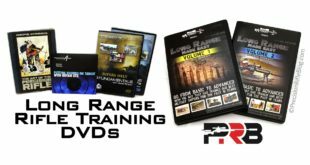 The OCW load development approach is a huge contribution to the shooting community. Maybe I’ll be fortunate enough to take one of your classes one day. I’ve heard great things. And I’m just trying to learn on here like everyone else. I’m smart enough to know that I don’t know it all! I just try to facilitate an environment that embraces questions and different points of view. I wish more forums were that way, but unfortunately most are pretty hostile places … especially for new shooters that ask “dumb questions.” New people are the lifeblood of any sport, so I hope we learn to embrace them. There just seems to be something about us as humans that instantly makes us into professional critics and dogmatic jackasses on the internet. 😉 I have to check myself in that! Ultimately, I’m just trying to figure this stuff out like everyone else. I have a fundamental view that I could learn something from anyone. The greeter at Walmart has something he could teach me, if I’d pause long enough to listen! I’m with you on your points here. I think people try to push cartridges to the limit, when a more responsible move might simply be stepping to a different cartridge that was designed for the velocities you were targeting. There is a little velocity fein in all of us, but it seems like that tempers over time (at least for some). Most realize the difference in ballistics is fairly negligible, and those people probably weren’t surprised by this WEZ analysis. 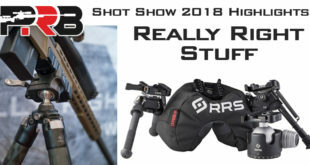 And yeah, I think max point blank range and the need for super-flat shooting cartridges just aren’t in as high demand now that most of us carry rangefinders. Every time I walk away from my truck on a hunt, I double-check to make sure I have my rifle, ammo, and my rangefinder … everything else is a nice to have. It’s funny how many people get really passionate about milling targets. I’ve yet to see anyone do that outside of a class that was specifically teaching you how to do that. I understand the military teaching that for backup, in case you’re in a life-threatening situation and your electronics fail. But it’s the civilians that get so worked up about it. As you said, in a day of affordable rangefinders … our priorities have shifted. I do the same thing on a hunt. Before any of the action starts, I range several points to have as reference, so I’m ready when an animal steps out. It seems like the most ethical approach, especially if you’re considering taking a long-range shot. Thanks for the feedback, Dan!